On the outskirts of Phoenix, located on five hundred acres of Sonoran Desert is Taliesin West, a complex designed by architect Frank Lloyd Wright, and devoted to modern architecture. The great architect established it as his winter camp, away from the bitter cold and snow of the Midwest. Wright wintered here from 1937 until 1959, the year of his death at 91. 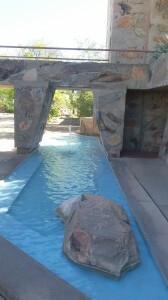 Our bus rolled up to Taliesin West in the morning, the sun brilliant on the rock walls and low forms of the buildings. Frank Lloyd Wright was a firm believer in blending buildings into the land forms upon which they were built. Before we entered the complex, I looked around at the landscape. In one direction rose the foothills of the McDowell Mountains, but in the opposite direction a gentle slope led down to the flatness of the desert plain. All around were the typical desert plants, the creosote bush, ocotillo, and cholla cactus. I found out that the rock walls I was looking at were constructed of desert rock, their interiors filled with boulders and concrete. 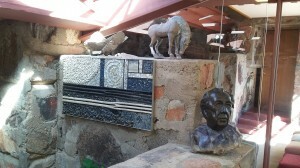 We began our tour of the complex at Wright’s living room. I sat in a most comfortable chair, actually designed by him, listening to the words of our guide and gazing at the interior of the room. Some people sat in chairs just like mine while others sat on a long bench-like couch along the wall with permanent cushions built into the wall for back rests. The room was built to accommodate many guests. Natural light flowed into the room from above through translucent white plastic and from the slanted windows along one side. The ceiling beams angled upward as though they reached for the sky, much like the natural desert forms in the area. Like all the buildings on the campus, it had a low profile, blending as much as possible with the desert around it. Next we walked into what was, at one time, Frank Lloyd Wright’s office. The room was smaller than the last, but built in the same general style, making good use of natural light. The actual desk he used, near the entrance, was still used by others. I imagined him sitting there, working on a new concept. We moved on to the Sunset Terrace, a series of wide red rock stair steps with lawn and a large pool in front of it. From here we had a good view of the complex and the desert around it. 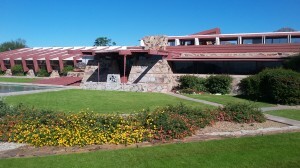 I noticed especially the nearby tall rounded mountain top that appears to look down on Taliesin West. I should mention that the space in between buildings is generally filled with gardens, slow-moving streams, pools or fountains, all adding a relaxing beauty to the campus. Next on our tour was the movie theater, the seating stair stepped for better viewing. Last on our tour were the drafting studios where students worked at their desks and drafting boards on architectural projects. No one was working as we walked through as it was a day off for them, but we could see the environment where they worked and learned. Again, the studios made great use of natural light. 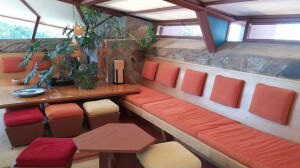 Taliesin West is like a self-contained city with its many functions. It contains apartments for the students and staff, a swimming pool, kitchen, dining room, library, conference rooms, visitor’s center and pavilion. We left Taliesin West and were on our way to eventually see the famous Biltmore Hotel on the outskirts of Phoenix, also designed by Frank Lloyd Wright. We were looking forward to an arranged dinner here as well as looking at the architecture. The first problem was that by the time we arrived at the hotel, the sun had set and the hotel was shadowed. We saw just enough of the lines to recognize the work of the great architect. Inside we basked in the light of chandeliers in the long majestic lobby. We then had a tour of the hotel led by a man who unfortunately spoke with a French accent so pronounced that we could hardly understand him. But we could certainly enjoy what we were seeing. The dinner that we had looked forward to was sadly disappointing, but the restaurant itself was spectacular. The day had been long, but interesting, but we were all ready for the ride back to our hotel rooms. Looking at Taliesin West from the outside, one can see that the low buildings blend in with the desert.